The arrival of VC-backed bike-share companies raises all sorts of questions about whether they will improve or hinder access to biking in the long run. New York, you may have heard, is about to get invaded by a swarm of bike-share companies. Their product is often described as “dockless” bike-share: They rely on “smart locks,” not fixed stations, to secure the bicycles. But dockless systems have been operating in cities including Hoboken and Portland for some time now — it’s not new to these shores. The real distinguishing characteristic is that the new arrivals are financed like Silicon Valley start-ups. The entry of these VC-backed bike-share companies raises all sorts of questions about whether they will improve or hinder access to biking in the long run. I don’t have a conclusive answer, but here’s an overview of the risks and opportunities as I see them. A major risk is that in the race to dominate the market, the companies will recklessly cut corners and flood cities with cheap, shoddy equipment. 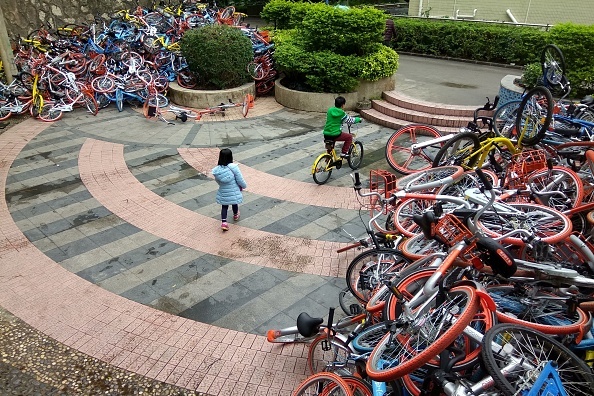 The iconic images associated with bike-share start-ups like Ofo and Mobike are the piles of broken, discarded bikes littering Chinese cities. The prospect of bike-share start-ups looking to inflate the value of their companies has alarmed city officials in the U.S. who’ve worked to establish bike-share as a new form of urban transportation. Last week the National Association of City Transportation Officials released a statement warning against companies “more interested in media attention and a quick buyout” than in coordination with local governments to meet public goals. In America, the established bike-share providers like Motivate, BCycle, and Social Bicycles have worked through government procurement processes, entering into enforceable agreements with cities that hold them to standards for service provision. Motivate, for instance, reports to NYC DOT every month on the state of its fleet, customer service activity, and maintenance metrics like how quickly reported bicycle defects are addressed. A San Francisco-based start-up, Spin — reportedly positioned as the first such company to launch in NYC — did not impress with the fragility of its bikes at this year’s SXSW. But the company insists that it supports regulation and will avoid the piles-of-abandoned-bikes scenario. In an email, CEO Derrick Ko said Spin would have a team dedicated to safety inspections, maintenance, and redistribution of bicycles. The scale of this support team in relation to the size of the fleet isn’t known, however. NYC DOT recently told the Staten Island Advance that it has scheduled information sessions with the new wave of bike-share companies but has no plans to enter into agreements with them. If New York shuts out these companies, however, it might be passing up an opportunity to expand access to bike-share in a relatively short amount of time. Streetsblog publisher Mark Gorton, on a recent trip to Shanghai, reports that the competing bike-share services are messy and chaotic at the moment — janky bicycles are everywhere — but also heavily used and, in general, welcomed by the public. The Chinese bike-share platforms are evolving too. In Shanghai, white areas on sidewalks denote bike parking zones, Gorton reports, and apps can track which users park improperly. Companies are starting to introduce incentives for users to park properly and report broken or wrongly-parked bikes. Anecdotally, the addition of hundreds of thousands of these bikes seems to be bolstering bicycle use after decades of losing mode share to cars. The question is whether it will last. Ridership is growing as the cost of a bike-share ride in Chinese cities drops, with companies pumped full of venture capital competing on price. Not everyone is convinced they will find a path to profitability, especially once they feel the full weight of maintenance and operation costs. This uncertainty has big ramifications, especially in New York City, where bike-share is at an inflection point. The system we have is working. Citi Bike is the biggest and most intensively used bike-share service in America. It will extend to new neighborhoods with the addition of 2,000 bikes this year, and it’s poised to grow further if Motivate and the city can agree on a framework to fund more rounds of expansion. While the expansion process has been slow to reach as much of the city as bike-share should, it also has the air of inevitability at this point. The worst-case scenario for New York would be to see the new bike-share operators flourish at the expense of the existing system, only to have the recent arrivals wash out a few years later if their business model turns out to be unsustainable. A better outcome would be more akin to what’s happening in Hangzhou, where competition has goaded the large, publicly-funded bike-share operator to adapt and improve its service. The American context will be different — the cost of doing anything here is higher than in China. And New York, with its privately-funded 10,000-bike system, is not exactly analogous to Hangzhou, which already had upwards of 50,000 bikes supported with public funds before the competitors arrived. But if New York can give new bike-share companies the opportunity to prove their value here while ensuring the equipment is safe, and without risking the substantial progress we’ve already made, that’s a path worth pursuing. A good thing about the dock-based system is that it forces the city to allocate space for parking the bikes, because, hey, you need to put the docks somewhere! I worry that if dockless bikeshare proliferates, the city may neglect to increase the bike parking supply commensurately. can you imagine the heads exploding if people left the bikes in free car parking spaces ? Junk bikes are a problem in any city with a lot of bikes. Let a hundred consortia of venture capitalists contend! that’s a good result – junk bikes are easy to recycle, but it’s difficult to create a cycling culture. If the insane bike share helped create a bike culture – good ! Maybe the threat of competition will encourage NYC to finally chip in to ensure the current system prospers. In my neighborhood, the UWS, Motivate is doing the bare minimum on rebalancing. Many docking stations are almost empty much of the time. Seemingly, they’re not so interested in offering a robust system if it conflicts with making a buck. This isn’t necessarily true. A bikeshare system requires a critical mass to succeed, and if the market fragments too much, you risk none of the players (including CitiBike) have the critical mass necessary to succeed. so you investing your money in any of these ventures ? Um, seriously? “create a bike culture”? We’re talking about China here. Not in the video you responded to though. And it looks more like it’s creating a throw away culture than a cycling culture. BTW where do I lock up my own bike? Those parking areas in the video don’t have racks. If these systems take off, will those of us with our own bikes get screwed over? Would NYC “chip in” or would it seek out bigger/more corporate sponsorship? City Hall warned bike-share start-up Spin not to move forward with plans for an unauthorized launch in NYC next week, and the company backed down this afternoon.